I navigate several languages and food cultures on any given week. I speak Dutch fluently but prefer to write in English. One of the downsides of this is that translations do not always convey the intricacies of culture and every day life. If I was to translate the Dutch word “stroop” into English, the dictionary tells me that the correct term to use is “syrup”. Yet, this is not entirely correct since the Dutch language also has the word “siroop“. Stroop is something else than just syrup. It’s a Dutch kitchen staple that ranges in consistency from the sweet fluidity of maple syrup to the product referred to as “apple butter” in the English language. Which is to say, a whole range of consistencies and textures can be referred to as “stroop” in Dutch. The most popular one, applestroop, widely used as a topping for pancakes, has the approximate consistency of molasses. 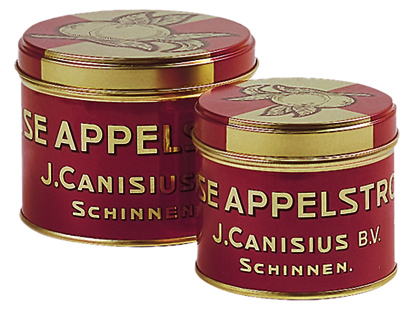 Rinse appelstroop from J. Canisius, one of the oldest brands which comes in an iconic tin, is similar to what would be referred to as “apple butter” elsewhere. Appelstroop is found in almost every kitchen in The Netherlands. I would say that it is to Dutch cuisine what maple syrup is to North American one. It is delicious over pancakes, be them the Dutch version of pannekoeken (which deserve their own post one of these days) or the American type. It’s also used as a topping on bread or in sandwiches. There are plenty of recipes (in Dutch) to make your own at home either with apples or pears or a combination of both. Quince used to be a common tree in Dutch gardens well into the mid 20th century. Then, as it happened with so many heirloom ingredients, it fell out of grace with the Dutch public. The blog Kweepeer.nl, which does a great job of tracing both the history and contemporary uses of quince in The Netherlands has facsimiles of pages of early 20th century cooking books with quince recipes. And then, this common fruit sort of disappeared from the collective Dutch radar. Nowadays quinces can be found at Turkish or Moroccan greengrocers all over Amsterdam. As soon as October rolls, we get the yellow beauties displayed in crates and stalls at the city markets and local shops. I adore quinces. The mere smell takes me back to my mom’s kitchen and her quince jelly. All these years living in The Netherlands, I never stopped using this fruit in a variety of ways. In many parts of South America, “queso y dulce” (cheese and sweet for a literal translation) is a very common dessert. A piece of queso fresco topped with either quince, guava or sweet potato paste. Just a couple of weeks ago, I made poached quinces (here’s a great recipe from David Lebovitz) and found myself with a whole bunch of uncooked quince peels, seeds and cores. Anyone who has cooked quince will tell you that these are the parts with the most pectin. Pectin is what gives jams, marmalades and jellies their consistency. Quinces are among the fruit with the most concentration of natural pectins. So, at this stage, I had two options: either make quince jelly (commonly made with these peels and cores) or throw them away. Instead, I thought I’d try to have two of my favorite sweet things meet: the Dutch stroop with the sweet, floral flavors of quince. Imagine my surprise when I found no recipe in Dutch for quince stroop. So, I made my own. I suppose this recipe can be improved and probably I will tweak it in time but for now, here it is. I am also adding the name in Dutch in hopes that local people interested in experimenting with quince can eventually find it. Place the quince peels, cores and seeds (and lavender flowers if using) in a medium sized pan. Add 4 cups of water and bring to a boil. Cover the pan and let the fruit simmer at a medium/ low fire. The reason you want to cover the pan and simmer slowly is because, at this stage, you do not want the water to evaporate. Instead, you are cooking the fruit so that it releases the pectin and its flavor into the water (and, if using the lavender flowers, so that they infuse your cooking liquid). After between 45 minutes and one hour of simmering, the fruit should be a dark pink and the cooking water should look the color of caramel. Remove the pan from the heat. Transfer everything (fruit and water) to a bowl or another pan. Rinse the pan you just cooked your fruit in so that you get rid of any residue from the fruit. You want your quince syrup to be cristalline so you need to minimize the amount of residue that makes it into the pan. Place a fine strainer over the rinsed pan (preferably not a cheese cloth because it can take forever for the liquids to pass through; however, if you don’t have a strainer, a cheese cloth would do but require an extra dose of patience and time). Strain the cooking liquids into the pan. Discard cooked fruit (and lavender if using). You should have around 4 cups of a dark pink colored liquid (water evaporation from the simmering should have been minimal). Add a generous cup of sugar and return the pan to a boil. Once the liquid is boiling, reduce the heat to minimum. You want to reduce your stroop slowly so that the sugars caramelize and add to the consistency and flavor. Continue simmering until the liquids have reduced by two thirds. You start with 4 cups of liquid and your goal should be to reduce till you have approximately one and a half cups of syrup. Transfer finished syrup to a jar (even a Tupperware will do if you don’t have any jars at hand). Let it cool off at room temperature and, once cool, put it in the fridge. The quince syrup can be kept for 3 weeks or so refrigerated.